When you open a CHS Mountain West Co-op charge account be sure to ask for fuel cards to use 24 hours a day at all of our fueling locations. We offer discounts for use of local cards up to 2 cents per gallon, depending on the fueling location. Need to track fuel usage? We can set up your cards to track odometer readings and vehicle numbers that come to you on a monthly report. Each account can have as many cards as needed and they are protected with a unique pin number. A local charge account will allow you to charge merchandise or fuel at any of our locations in Western Montana. 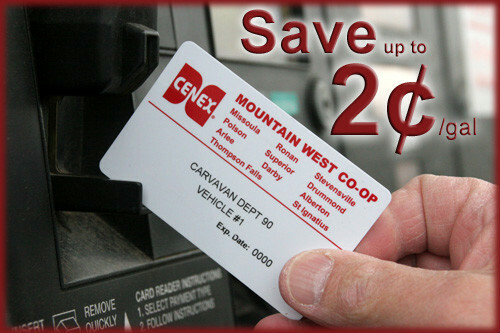 You may also have fuel cards that will charge fuel to your account 24 hours a day from any of CHS Mountain West Co-ops fuel sites. To apply, download and fill out the appropriate form(s) below. *Cenex® Ruby Fieldmaster Premium Diesel is available on the pump at the Missoula, Ronan and Stevensville locations.